Charlemagne Palestine - Omminggg & Schlomminggg. Vinyl LP. Bleep. 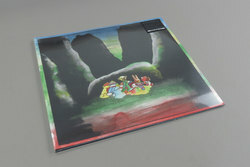 Second release by continuous music pioneer Charlemagne Palestine and Grumbling Fur consisting of London based multi-disciplinary artists Daniel O'Sullivan and Alexander Tucker; the Time Machine Orchestra being the extended drone arm of Tucker and O'Sullivan's experimental avant-pop conception. This double LP captures a performance of the trio at Copenhagen's illustrious Jazzhouse in 2016. The pin-drop acoustic clarity of the venue providing an ideal setting for this mesmeric recital of eternal music. The signature strumming of Palestine's piano augmented by Tucker and O'Sullivan's earthware electronics and processed strings create seamless sonic ripples in a constant state of unfolding. This is perhaps the most demonstrative document of Palestine's powerful vocal delivery - an alien hybrid of sacred music drawing deep from the well of the cantorial synagogue and Hindustani classical styles in a bid to channel inter-dimensional beings from ancient cultures. In some respects this could be thought of as Charlemagne in dub as Grumbling Fur carefully twist and mangle their palette of electrified harp, viola, bowed mandolin, percussion, tapes and voice transformers through chains of loopers resulting in a slowly dilating vapour.